Although the saying "comparing apples to oranges" refers to the inability of comparing things that aren't at all alike, it doesn't apply to real apples and oranges. Both are popular and nutritious fruits that fit in the palm of your hand. Still, they differ in many ways. Include both in your diet to reap the benefits of each fruit. One medium orange and one medium apple both contain about 75 calories and weigh approximately 150 grams. The calories in both fruits come mainly from carbohydrates. One medium apple has 21 grams of carbohydrates, of which 16 grams come from sugar. One medium orange has 18 grams of carbohydrates, of which 14 grams come from sugar. Oranges have 1.4 grams of protein and apples have 0.4 gram. Both apples and oranges contain only a trace of fat. Oranges are a main source of vitamin C in the U.S. One 150-gram orange contains 80 milligrams of vitamin C, about 133 percent of the daily value for a 2,000-calorie diet. In contrast, a 150-gram apple contains about 7 milligrams of vitamin C. Oranges are slightly higher in vitamin A, providing 7 percent of the daily value, compared with 2 percent provided by an apple. Oranges are a good source of potassium, with almost 300 milligrams, while an apple has about 160 milligrams. When it comes to folate, oranges come out ahead, with 45 micrograms compared to only 4 micrograms in an apple. 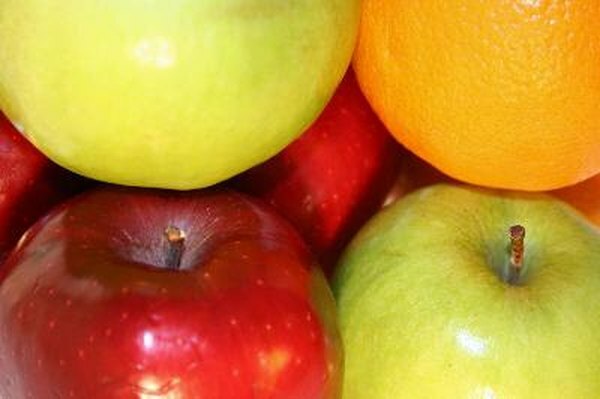 The average apple has almost 4 grams of fiber, and the average orange has the same amount. Though fiber is not absorbed by the body, it provides health benefits. Apples and oranges contain both soluble and insoluble fiber. Together, the two types keep bowel movements regular, lower cholesterol and regulate blood sugar. Women should aim for approximately 25 grams of fiber daily, and men should aim for about 38 grams. Eating a variety of produce is important. No one type provides all the nutrients you need. The key to reaping health benefits lies in eating both apples and oranges, along with a wide variety of other fruits and vegetables. Variety is just as important as quantity, according to the Harvard School of Public Health.